Scotland’s Isle of Arran Distillers is one of the most recent whisky brands to appoint a female ambassador. 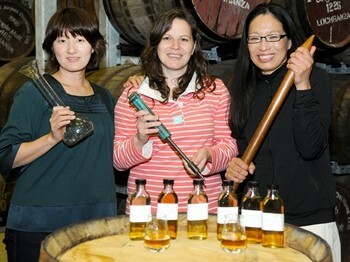 Keiko Manni, spirits block leader for Tokyo’s prestigious department store, Isetan, was given the title when she visited the Scottish distillery with her colleague Sueko Yamada, who runs Isetan’s in-store spirits bar. Between them, the two women are credited as a driving force behind the brand’s sales in Japan. This ambassadorial role is just one example of the influential role many women are playing in the development of the traditionally male-dominated whisky sector. Annabel Meikle, sensory whisky creator at Glenmorangie, recently suggested that women have the natural ability to pick up on subtle aromas that make them ideal for working with whisky.